One April evening in 1860. Franklin Sanborn answered a knock on the door of his home in Concord, Mass. Deputy U.S. Marshal Silas Carleton and three men with handcuffs stood on his doorstep. Sanborn, a schoolteacher, knew why they had arrived. His involvement in John Brown’s raid on Harper’s Ferry had come to light during Brown’s trial. Sanborn belonged to the Secret Six, a group of abolitionists convinced slavery would not die a peaceful death. They had met with Brown to discuss ways to attack the slave system and supported him financially. Franklin Sanborn had been a troublemaker from an early age. He was born in Hampton Falls, N.H., on Dec. 15, 1831. At 9 he decided slavery was wrong and the U.S. Constitution should be revised or revoked. 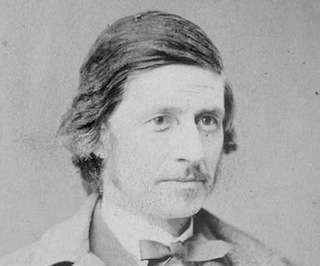 He became a journalist, author and social reformer, a friend of his Concord neighbors Ralph Waldo Emerson and Henry David Thoreau. After the discovery of the Secret Six, Congress ordered Sanborn to Washington to answer questions about Harper's Ferry. He declined. And so the marshals appeared at his door. He resisted, knowing his neighbors would help him. As they approached the door I braced my feet against the posts and delayed them. I did the same at the posts of the veranda, and it was some minues before they got me on the gravel walk at the foot of my stone steps. When they tried to put him in the carriage, he broke the carriage doors with his feet. Finally, the marshals manacled his feet and tried to shove him in the carriage. They couldn't, because a middle-aged neighbor, Anne Whiting, climbed into the carriage and fought them off with a cane. The marshals scratched her and tore her dress, but she fended them off long enough so more neighbors could come to the rescue. Church bells pealed as more than a hundred townspeople rushed to defend Sanborn. Ralph Waldo Emerson ran out of his house and a neighbor summoned Judge Ebenezer R. Hoar. Hoar issued a writ of replevin, formally demanding the surrender of the prisoner. The deputies refused to let Sanborn go. The crowd overpowered them and freed Sanborn. 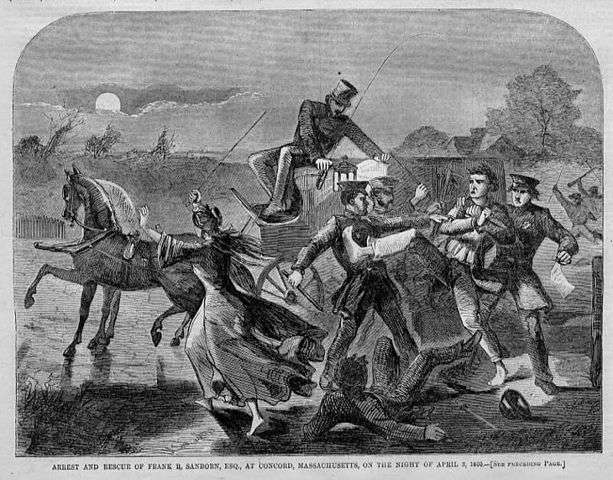 The marshals jumped into the carriage as the crowd threw stones at it. One of Sanborn's neighbors, Louisa May Alcott wrote about the event. "Sanborn was nearly kidnapped. Great ferment in town. Annie Whiting immortalized herself by getting into the kidnapper's carriage so that they could not put the long legged martyr in." The next day, Sanborn went to court in Boston to answer the questions about Harper's Ferry. Looking out over the courtroom he saw Walt Whitman. The poet had come to Boston to supervise the third printing of Leaves of Grass. When he heard about Sanborn, he went to the courthouse to help him escape if necessary. The court did not convict Sanborn. Franklin Sanborn would go on to live a long and productive life. He wrote early biographies of many of the Transcendentalists, including Bronson Alcott, Louisa May's father. His biographies, however, have been criticized as unreliable. ...confidential adviser to John Brown of Harper's Ferry, for whose sake he was ostracized, maltreated, and subjected to the indignity of false arrest, having been saved from deportation from Massachusetts only by mob violence. This story about Franklin Sanborn was updated in 2018. It’s great to read a story like this. Thank you.